TGIF! The weekend can't come soon enough for some after a bruising few days. 1. More pain to come? European markets were trading weaker as investors remain rattled by a string of poor economic numbers from Germany, and slower global growth. There was more disappointing data Friday, this time from Italy -- the eurozone's third largest economy -- where industrial production in August was 0.7% weaker than a year ago. "August industrial production for all the big 4 countries in the eurozone has now been published, and, according to our calculations, they are consistent with a 2% decline in the month for the Eurozone aggregate," wrote Victor Echevarria at BNP Paribas. U.S. stock futures were slipping lower. Asian markets ended firmly in the red. 2. 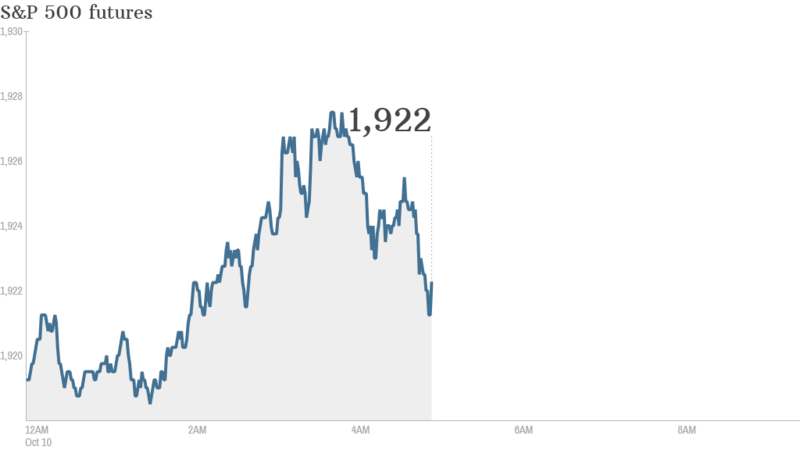 Rollercoaster ride: The Dow plunged 335 points Thursday, its worst day of the entire year on a point basis. The wild swing lower followed a sharp jump Wednesday, the best day of the year so far for stocks. Both the S&P 500 and Nasdaq fell more than 2% on Thursday. Investors are about as terrified as they can be right now, according to CNNMoney's Fear & Greed index. 3. Oil price plunges: The prospect of weaker global growth is hitting commodity markets hard. Crude oil futures in Europe were trading 1.4% weaker at $89 a barrel, their lowest level in nearly four years. U.S. light crude has lost nearly 18% over the past 12 months. 4. A new Tesla: Tesla (TSLA)has unveiled its model D, a dual motor, all-wheel-drive sedan with mind-bending performance numbers.